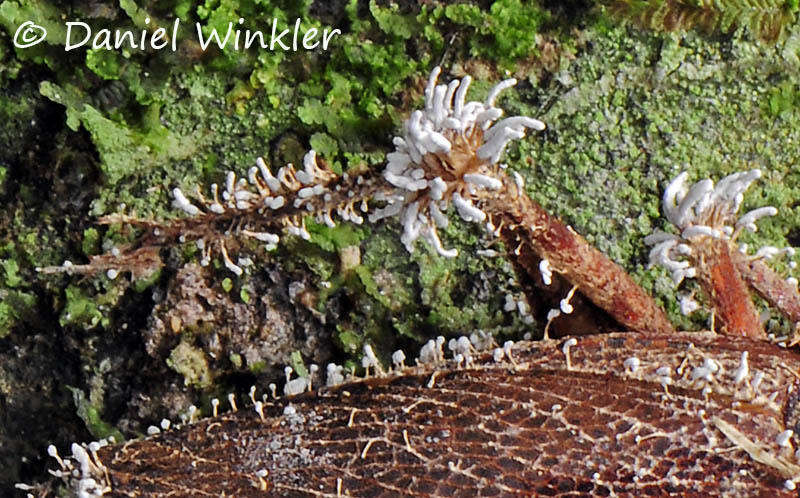 Photos from Cordyceps fungi and allies parasitizing insects and spiders we found Mushroaming in Madidi National Park in the Bolivian Amazon in early February 2014. Many of the identifications based solely on my photos were done with the generous help of Tatiana Sanjuan, Bogota, Colombia. 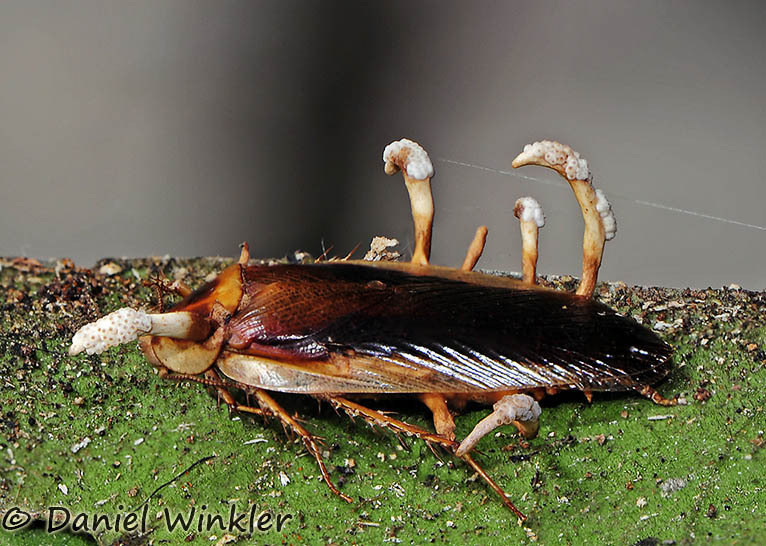 Ophiocordyceps blattae, a very rarely encountered Cordyceps growing from a Blattaria cockroach. I stacked several images to have all the fruiting bodies in focus. 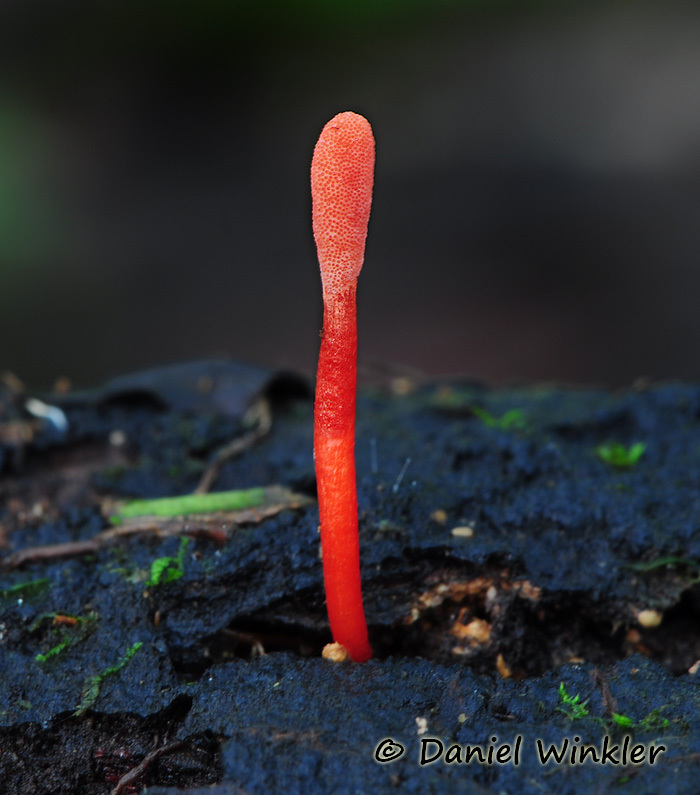 Ophiocordyceps volkiana [(Möller) G.H. Sung, J.M. Sung, Hywel-Jones & Spatafora] fruiting out of a fallen trunk. We nick-named it "Moose-antler Cordyceps". 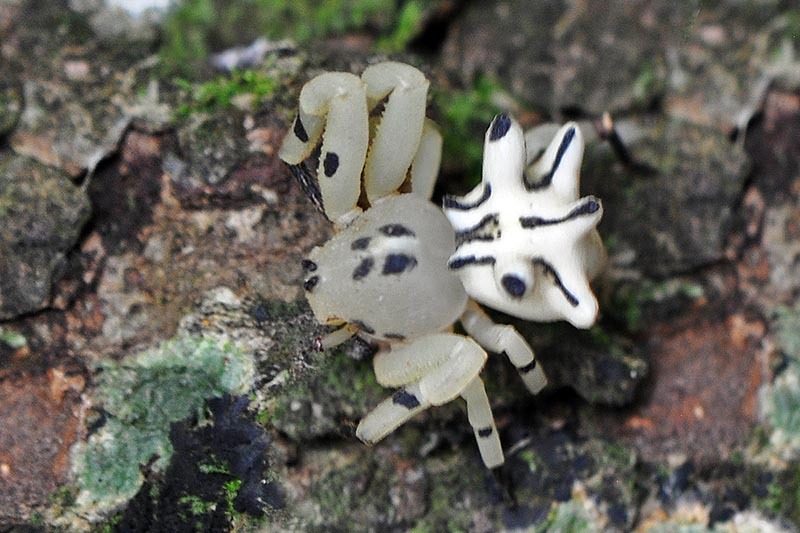 Möller, when first describing this Cordyceps in 1901, was struck by the similarity of the Cordyceps and the crab spider (Epicadus heterogaster) that pretends to be a flower when sitting on a leaf. 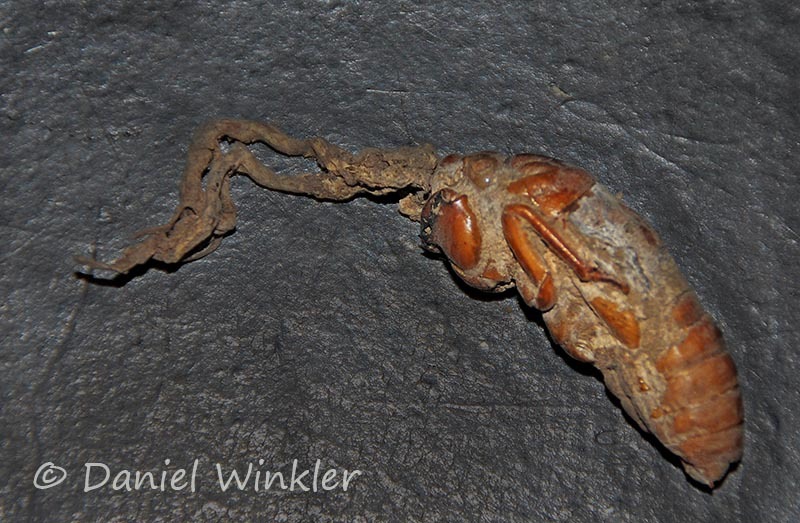 Here the excavated insect host, which seems to be a larva of a Coleoptera beetle. 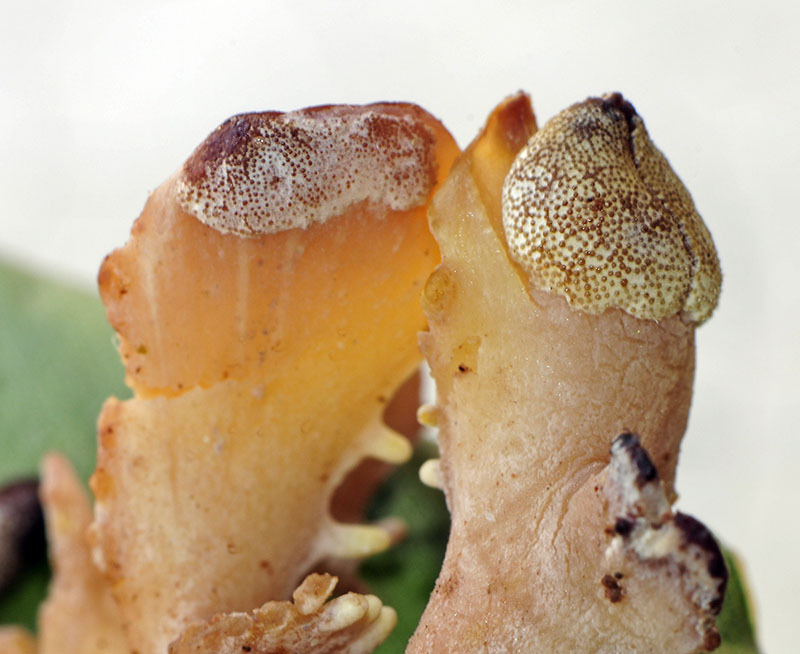 Close up of the perithecia of the Cordyceps ". I kept the insect host moist for several days and teh perithecia developed, but at some point they dried out. 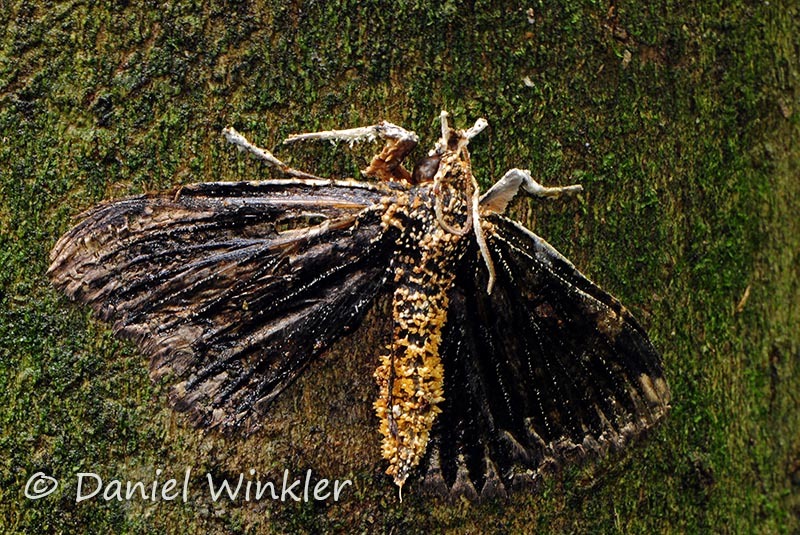 Multiple stromata growing out of a layer of pieces of bark and lichen covering an owlet moth pupa (Noctunidae, Lepidoptera, see below). It seems like the larva chew chunks out of the Cryptothecia striata lichen from this site and stitched them together to camouflage itself when going through the pupae state. 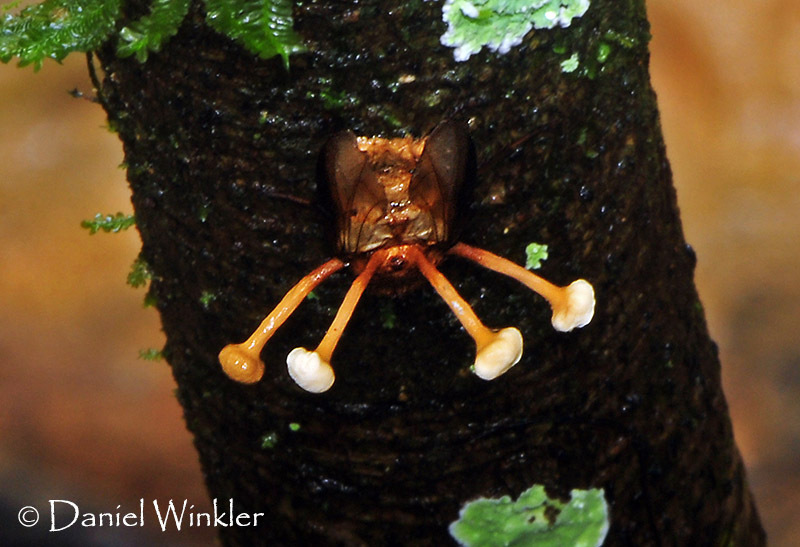 However, all that work did not help to hide from spores of a Cordyceps possibly close to Cordyceps militaris. It just "crawled" under the blanket with the larva and digested it to feed its own organism. 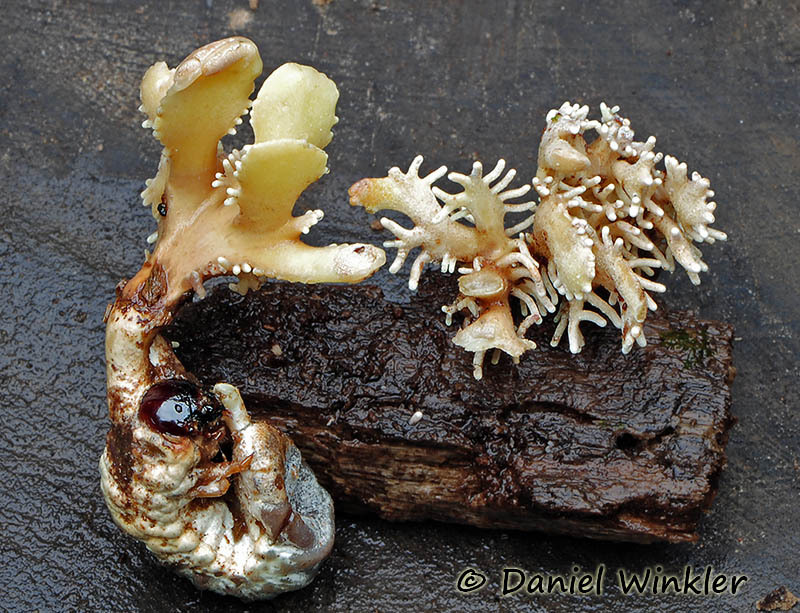 The Cordyceps fruiting bodies were growing through the lichen blanket. Under that layer of camouflage we found a fat Noctuida pupa. Possibly Ophiocordyceps pentatomae [(Koval) G.H. Sung, J.M. Sung, Hywel-Jones & Spatafora] growing out of adult stink bugs (Pentatomidae, Heteroptera). These specimen were found on the forest floor amongst leaves, but not really buried. 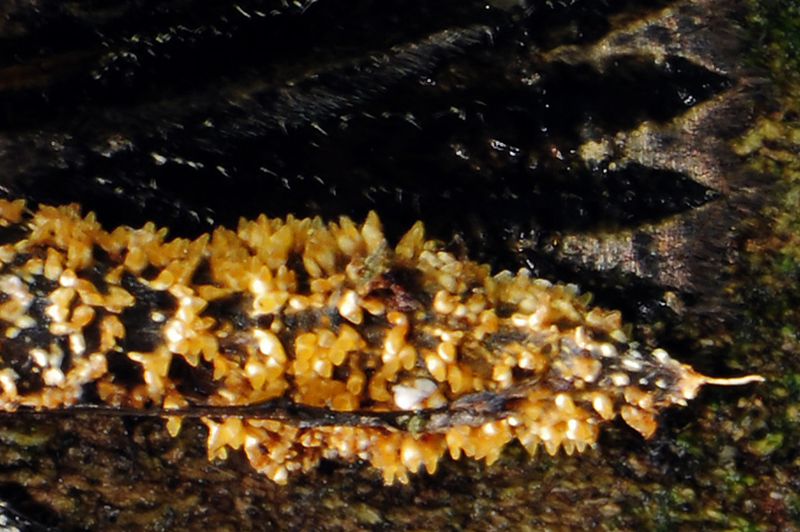 Close up of the fertile ascoma of Ophiocordyceps pentatomae and the sterile apex of the stroma. 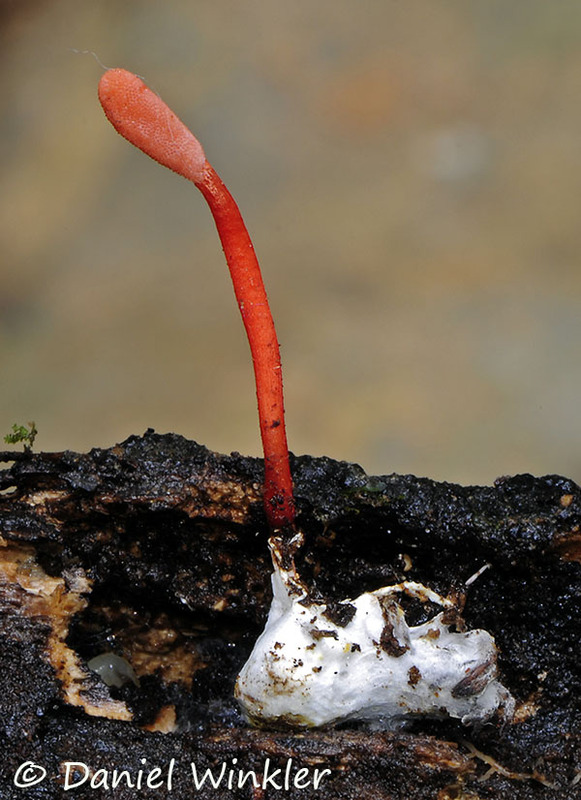 Ophiocordyceps caloceroides, a colorful spider parasite. 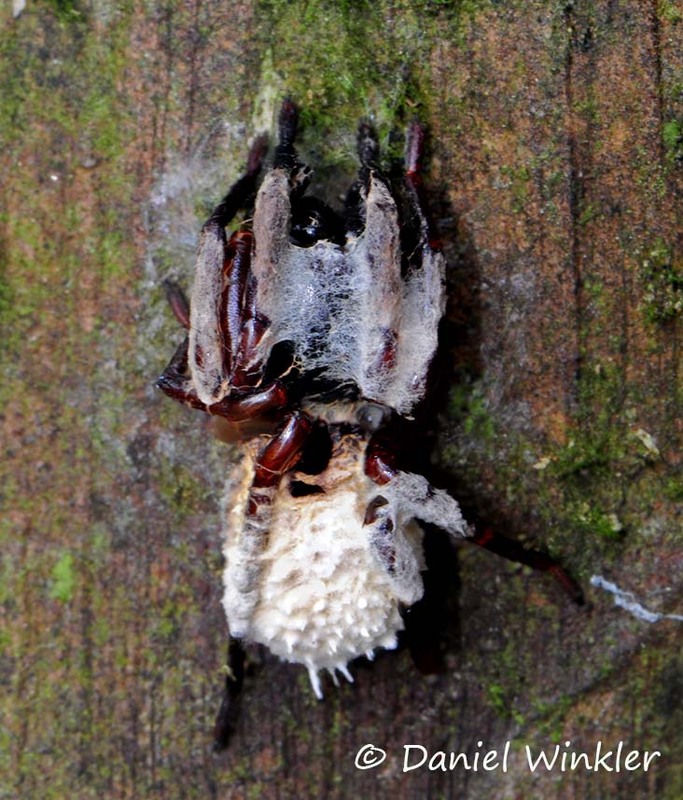 Excavated Ophiocordyceps caloceroides growing out of a spider covered in mycelium. 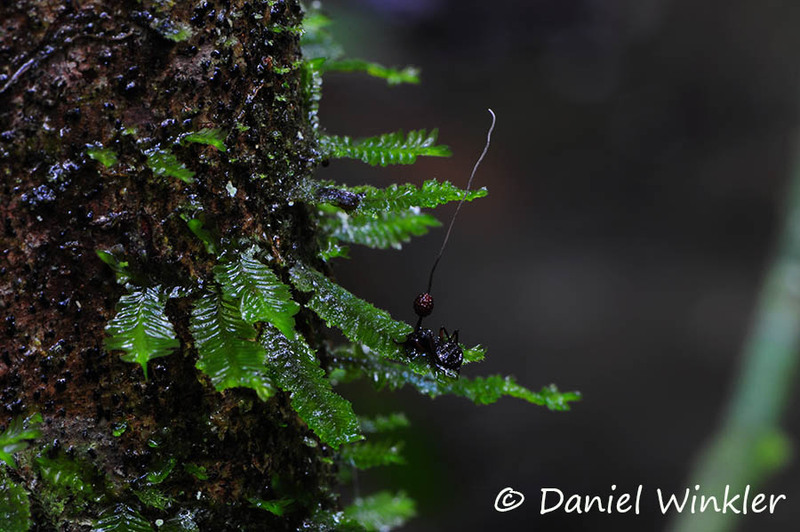 Ophiocordyceps dipterigena, one of the most frequent Cordyceps we found. 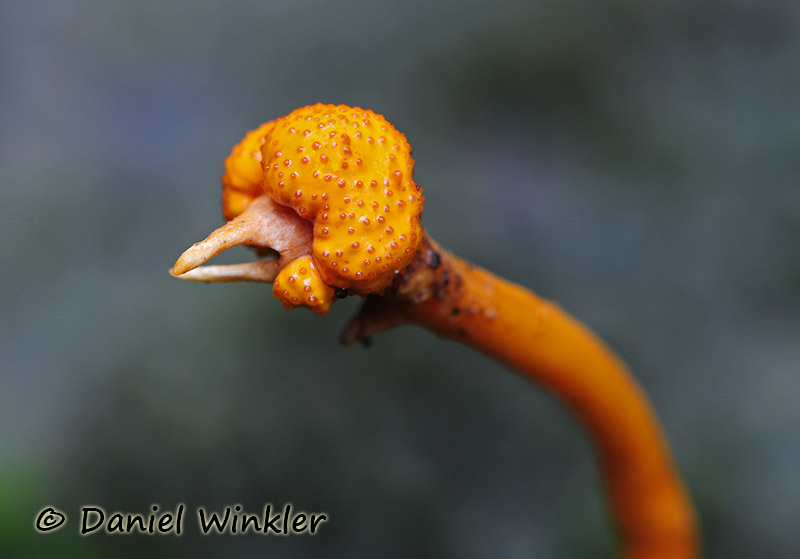 An Ophiocordyceps close to O. curculionum. I found a very similar specimen in Ecuador that was an undescribed species. That's all we saw when we found it. Digging it out of the wood was quite a challenge. A nest with aggressive ants was on high alert when we broke the rotten log trying to extract the host insect. Isaria amorpha growing on a Orthoptera (Petch). The fungus attached the infested locust-like insect firmly to the lichen-covered bark. A moth with a bad case of fungal infection. Looks like a Cordyceps anamorph. A close up of the infected moth from above. Unfortunately I did not have time to use the tripod. Once again we were at first not sure what we found there. Maybe some strange Xylaria? Anyway, it took us over a quarter of an hour to get to the base of the fruiting bodies, the wood was extremely hard and the access tunnel too narrow to find out if there was actually an insect on the base of the fruiting bodies. The hard work paid off. 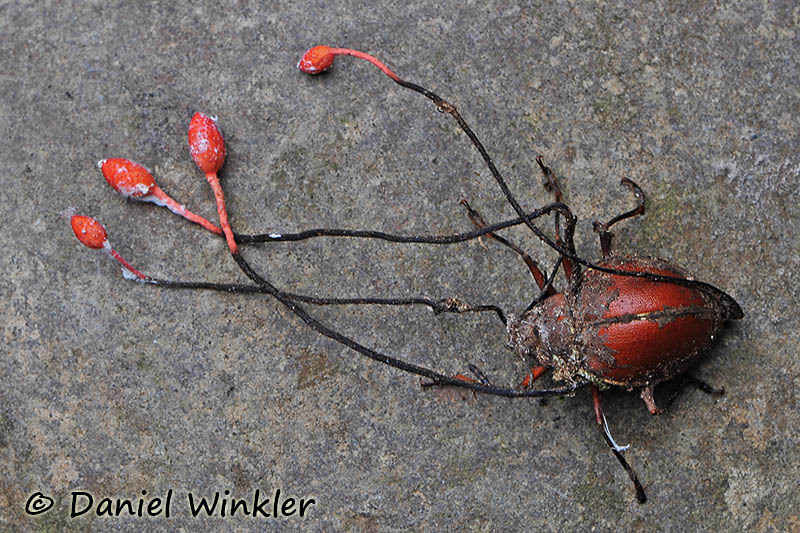 We found a host beetle with a bad case of Cordyceps. 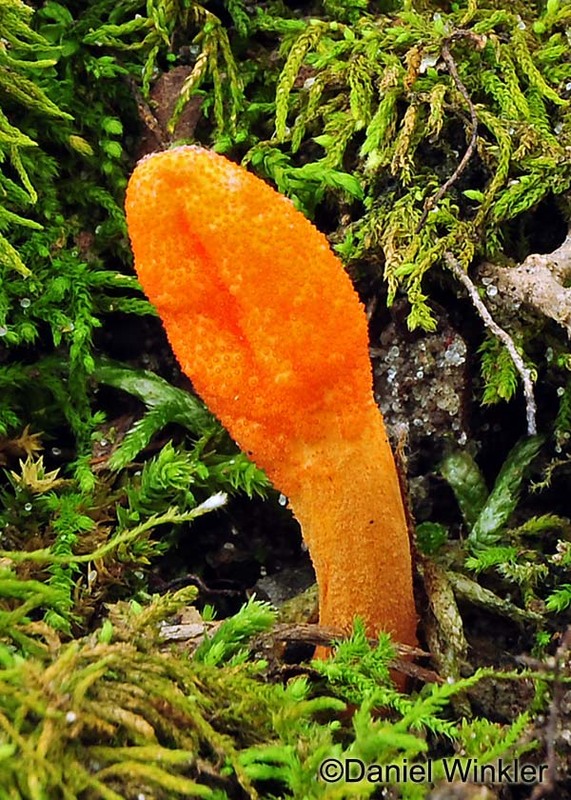 Ryan Kepler suggested it might be Ophiocordyceps erotyli with a Polycephalomyces infection. 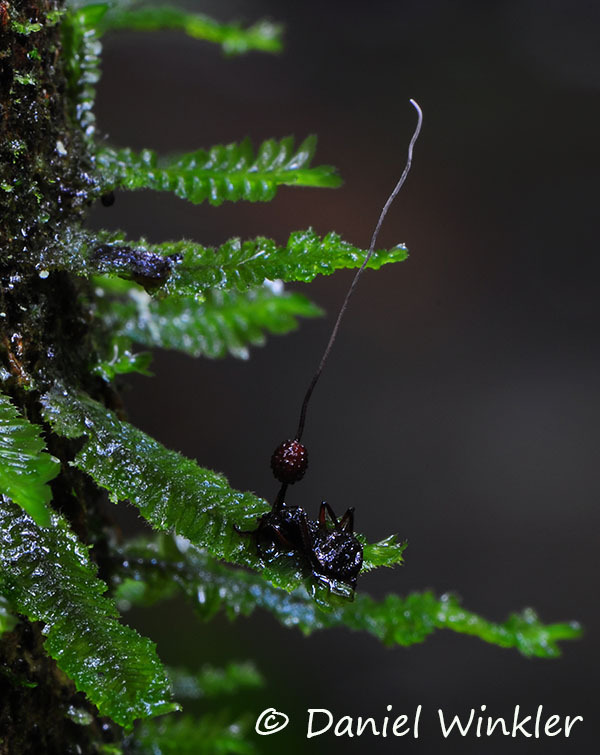 We had previously assumed it might be Stilbella buquetii, a Cordyceps anamorph, now based on the rule 1 fungus= 1 name, transferred to Ophiocordyceps, hence O.buquetii. 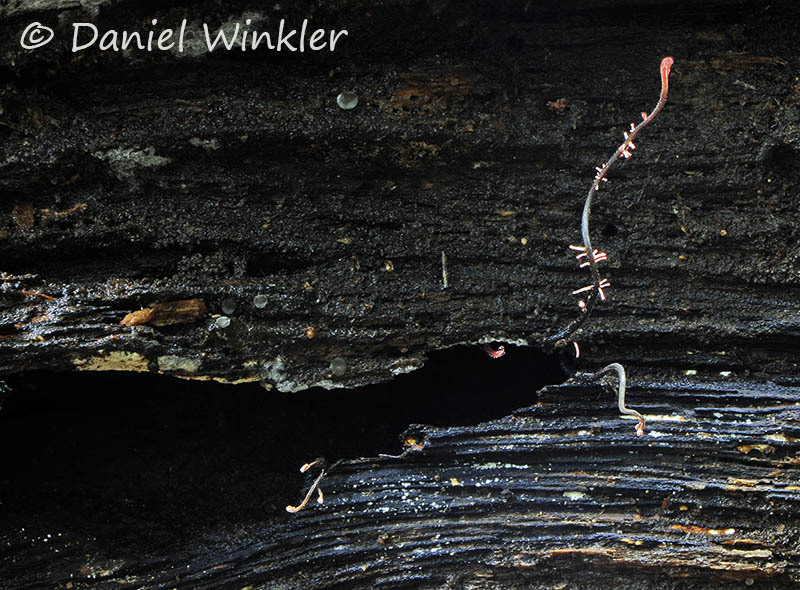 A spider caught in the net of a fungi, well, covered by the mycelium of a Torrubiella species. A tiny speck under a half fallen trunk. It was too high up to get a good tripod shot. I am not exactly sure what we saw there, but it seems to be a Torrubiella species. Interesting is that there seems to be perithecia, the yellow-orange globular structures and the long white synnemata of the anamorph. 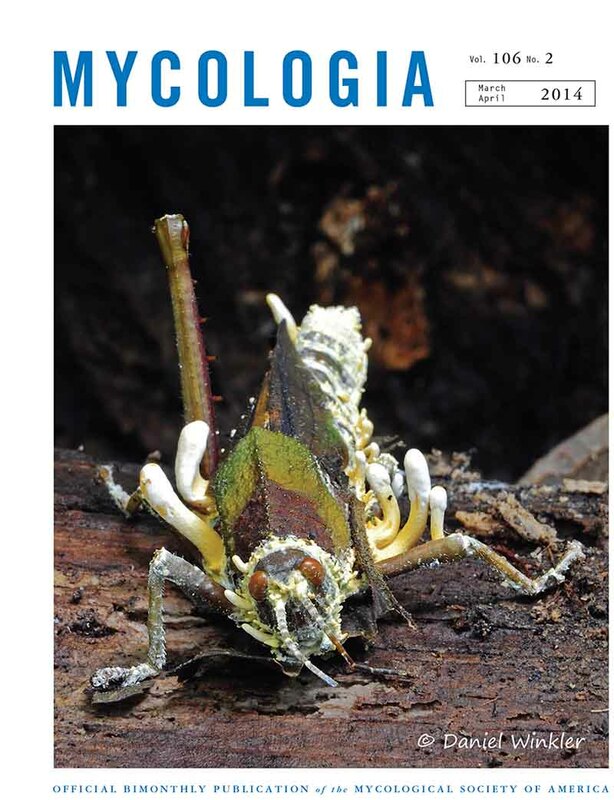 Interestingly here an open access paper that looks into the effects on liver cancer cells of one of the "minor" medicinal Cordyceps species, Cordyceps cicadae. There has been a bunch of research into C. cicadae, especially regarding kidney support and also as an TCM asthma remedy (see refernces of this paper). Anyways, some years ago I have bought a few specimen for very cheap in a locally sourced materia medica & souvenir store in Gyalthang, currently Shangrila, Deqen Tibetan Autonomous Prefecture Yunnan. And the low price is one of the arguments for this Cordyceps, since Tibetan Yartsa gunbu (Ophiocordyceps sinensis) is just astronomically priced. Cordyceps cicadae is a medicinal fungus that is often used for treating cancer. However, the anticancer mechanisms of C. cicadae are largely unknown. This study aims to investigate the anticancer mechanisms of C. cicadae against hepatocellular carcinoma cells in vitro using a proteomic approach. Human hepatocellular carcinoma MHCC97H cells were treated with a water extract of C. cicadae(0, 100, 250, 500, and 1000 μg/mL) for 48 h and harvested for cell viability assays. The significant differences in protein expression between control and C. cicadae-treated cells were analyzed by two-dimensional gel-based proteomics coupled with matrix-assisted laser desorption ionization-time of flight mass spectrometry. Flow cytometry analysis was employed to investigate the cell cycle and cell death. The anticancer molecular mechanism was analyzed by whole proteome mapping. The water extract of C. cicadae (0, 100, 250, 500, and 1000 μg/mL) inhibited the growth of MHCC97H cells in a dose-dependent manner via G2/M phase cell cycle arrest with no evidence of apoptosis. Among the identified proteins with upregulated expression were dynactin subunit 2, N-myc downstream-regulated gene 1, heat shock protein beta-1, alpha-enolase isoform 1, phosphatidylinositol transfer protein, and WD repeat-containing protein 1. Meanwhile, the proteins with downregulated expression were 14-3-3 gamma, BUB3, microtubule-associated protein RP/EB family member 1, thioredoxin-like protein, chloride intracellular channel protein 1, ectonucleoside triphosphate diphosphohydrolase 5, xaa-Pro dipeptidase, enoyl-CoA delta isomerase 1, protein-disulfide isomerase-related chaperone Erp29, hnRNP 2H9B, peroxiredoxin 1, WD-40 repeat protein, and serine/threonine kinase receptor-associated protein. The water extract of C. cicadae reduced the growth of human hepatocellular carcinoma MHCC97H cells via G2/M cell cycle arrest. When Nicole Cook found this Cordyceps during our January 2012 Mushroaming Bolivia trip, it was still known as Cordyceps locustiphila. 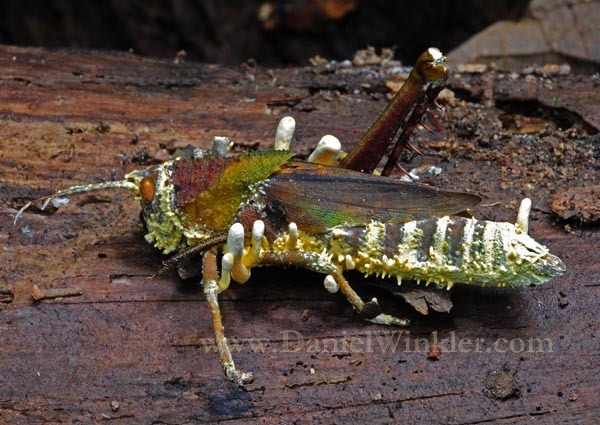 Abstract: In the Amazon the only described species of Cordyceps sensu stricto (Hypocreales, Cordycipitaceae) that parasitize insects of Orthopterida (orders Orthoptera and Phasmida) are Cordyceps locustiphila and C. uleana. However, the type specimens for both taxa have been lost and the concepts of these species are uncertain. 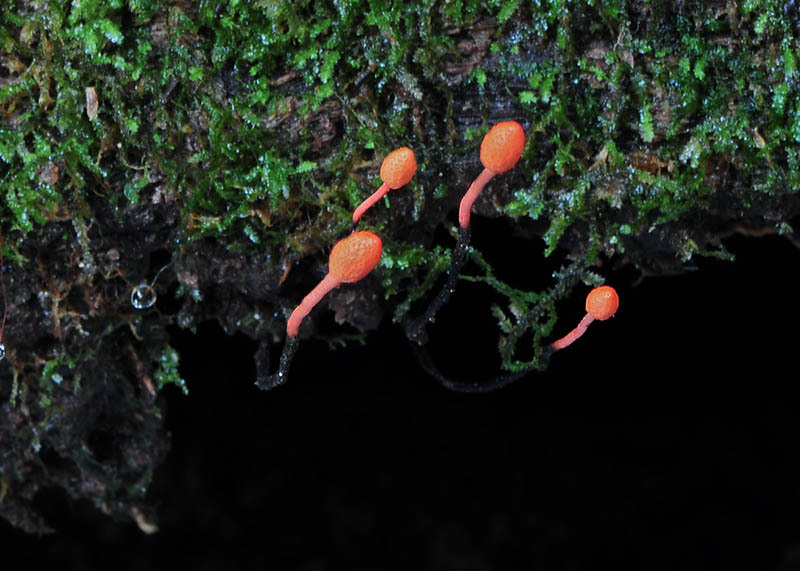 To achieve a more comprehensive understanding of the systematics of these species, collections of Cordyceps from the Amazon regions of Colombia, Ecuador and Guyana were subjected to morphological, ecological and molecular phylogenetic studies. Phylogenetic analyses were conducted on partial sequences of SSU, LSU, TEF, RPB1 and RPB2 nuclear loci. 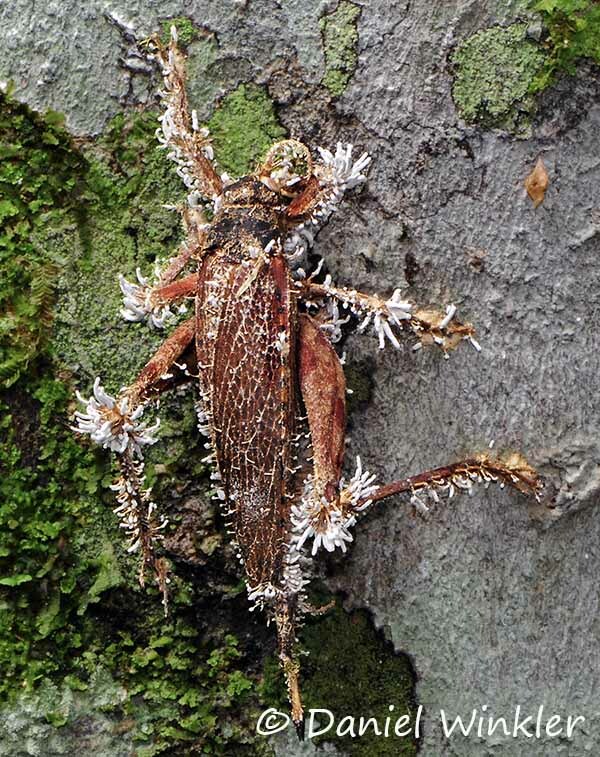 Two new species are proposed including C. diapheromeriphila, a parasite of Phasmida, and C. acridophila, a parasite of the superfamily Acridomorpha (Orthoptera), which is broadly distributed across the Amazon. For C. locustiphila a lectotypification and an epitypification are made. 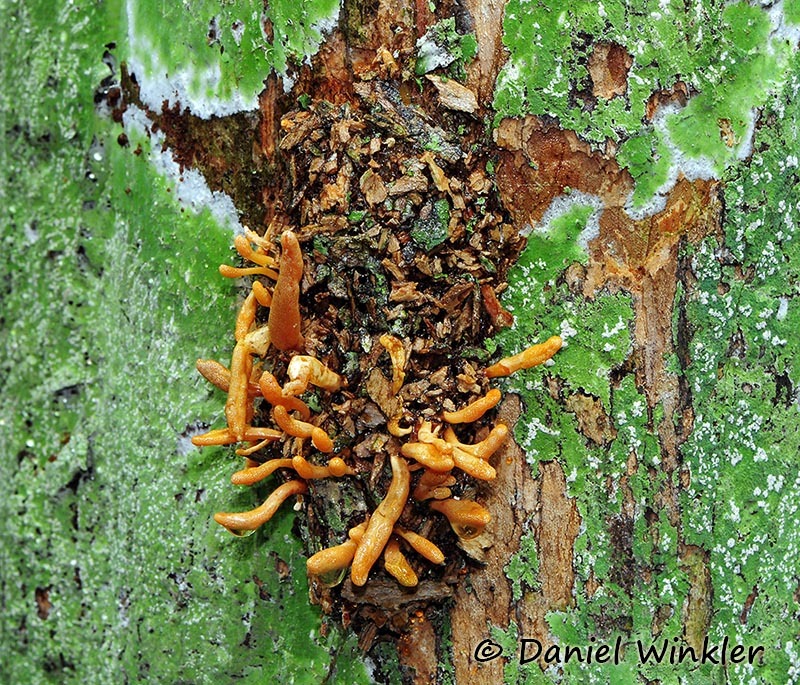 Cordyceps locustiphila is host specific with Colpolopha (Acridomorpha: Romaleidae), and its distribution coincides with that of its host. The phylogenetic placement of these three species was resolved with strong support in the Beauveria clade of Cordyceps s. str. (Cordycipitaceae). This relationship and the morphological similarity of their yellow stromata with known teleomorphs of the clade, suggest that the holomorphs of these species may include Beauveria or Beauveria-like anamorphs. 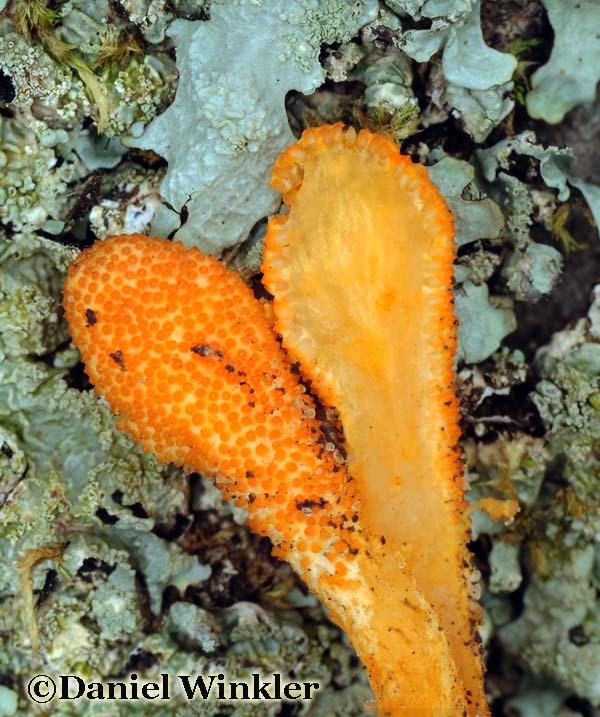 The varying host specificity of the beauverioid Cordyceps species suggest the potential importance of identifying the natural host taxon before future consideration of strains for use in biological control of pest locusts. Apparently the Agriculture Department of Tibet Autonomous Region has published the 2013 Yartsa gunbu harvest quantities [See the press article from CCTV news webpage]. In brief 2013 a harvest of 53.7 tons was recorded. 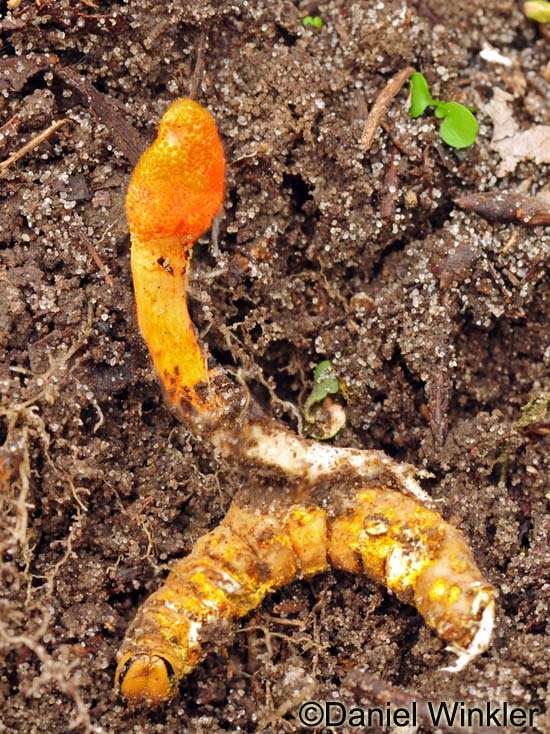 Since 1999 the annual Yartsa gunbu harvest is recorded in Tibet AR, a very important contribution to understanding the Cordyceps phenomenon, but unfortunately an unique achievement. Tibetan areas in Sichuan, Qinghai, Yunnan and Gansu do not record their annual harvest, which is especially disappointing in the case of Qinghai Province, whose production often is higher than Tibet AR. To put the 53.7 tons harvested in 2013 into historic context, since 1999 the annual harvest fluctuated between 33 t to 57 t, on average it was 44 t (see graphic below, blue figures on left). So clearly 2013 was a productive year. And it is great to hear that resource depletion at least when it comes to overall output is not evident in this number. To the contrary, these 53,700 kg attest to the relative resilience of Yartsa gunbu. Still, as written since many years, increased or at least stable output can be partially attributed to more areas being ever more intensely searched. These statistics do not allow to factor this in. On the other side, the news release reports that the 53.7 t were a 50 percent year-on-year increase from 2012, which indicates that the harvest in 2012 was a meager 36 t. This low figure does not come as a surprise, since the winter and spring of 2011/2012 was reported to be drier and warmer than usual, too factors that seem to reduce productivity. All in all, these production amounts are within the range of previously recorded harvests and thus demonstrate that at least in Tibet AR we seem not to witness total resource exhaustion as claimed by some other sources. 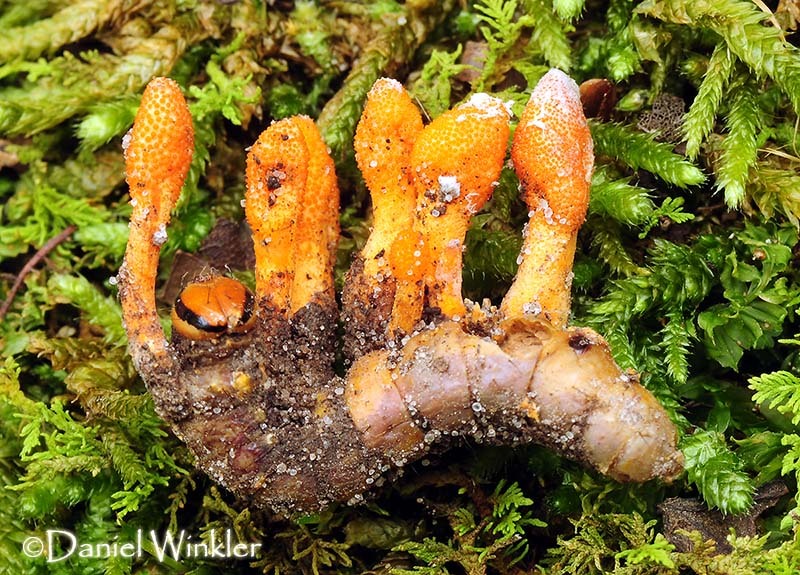 For a discussion in detail on the issue of sustainable harvesting in past and present please see my blog-entry from May 4, 2010 [link to the blog: cordyceps-crisis-or-reporting-crisis ?]. 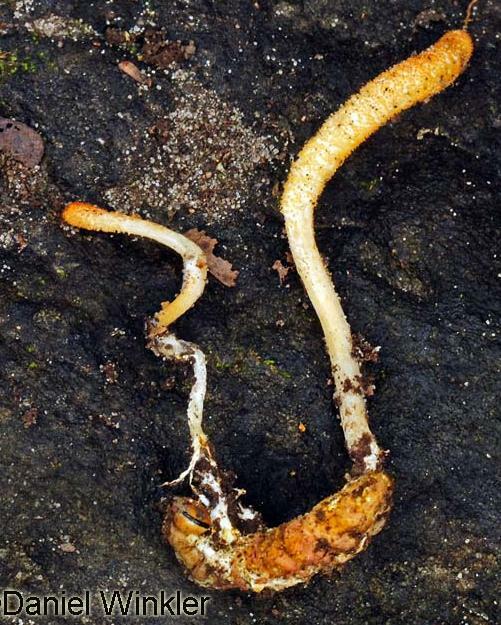 LHASA, Feb.22 The output of Cordyceps sinensis in Tibet in 2013 has reached 53,700 kilograms, a 50 percent year-on-year increase compared with that of 2012, according to the Agricultural Department of Tibet Autonomous Region. Due to more precipitation and better weather than previous years, this herb enjoyed a facilitative environment and consequently a sharp increase in output. 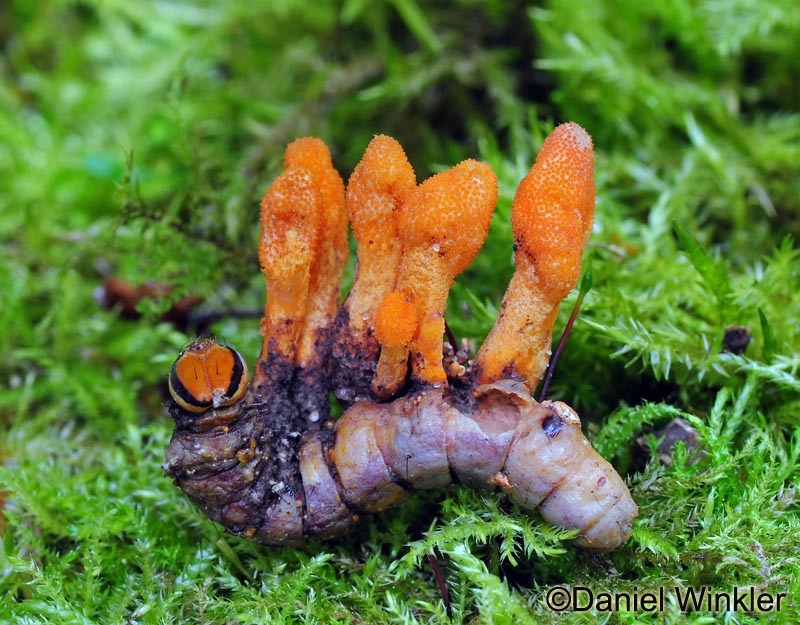 The Cordyceps sinensis is a swift moth larva with parasitic fungus that grows between 3,000 to 5,000 meters above the sea level. In winter, the fungus hibernates under the soil and in between spring and summer, it grows out of the swift moth and into the shape of herb. That is the reason why it is also called "winterworm summerherb". 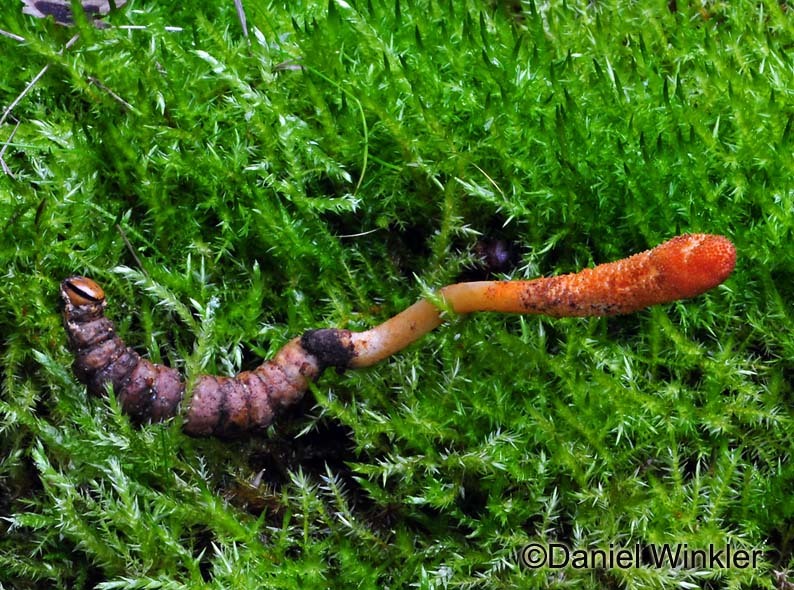 At a forest walk during the annual North American Mycological Association (NAMA) foray in Harriet, Arkansas, we came across a dozen Cordyceps militaris. Here photos from the specimens we dug up from the soft soil. Some where growing from below leaf debris, some from below moss. We also left several specimens undisturbed in the ground. 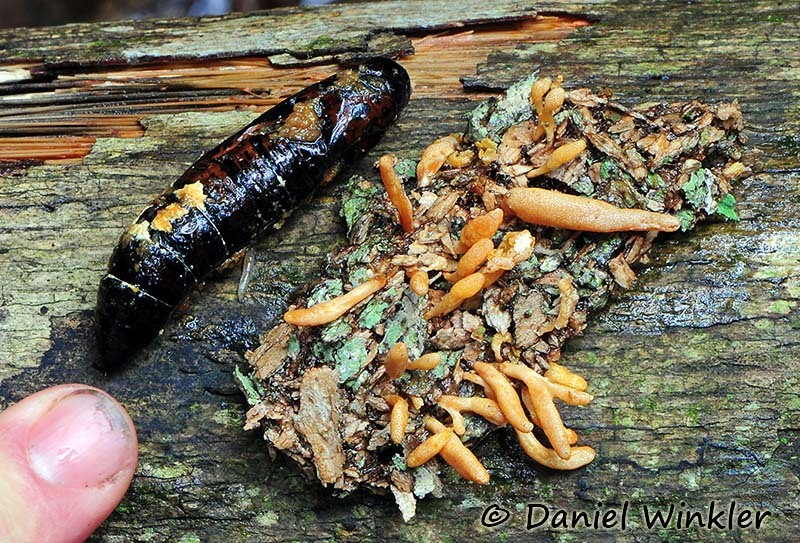 What is very interesting is that these Cordyceps militaris is growing on Lepidopteran larvae and not pupae as most commonly encountered. The order Lepidoptera includes butterflies and moths. 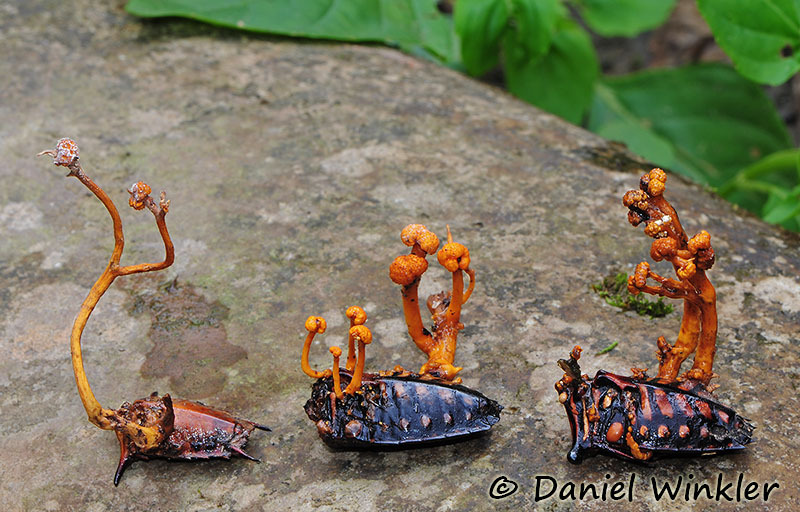 Morphologically they look very much like regular Cordyceps militaris. 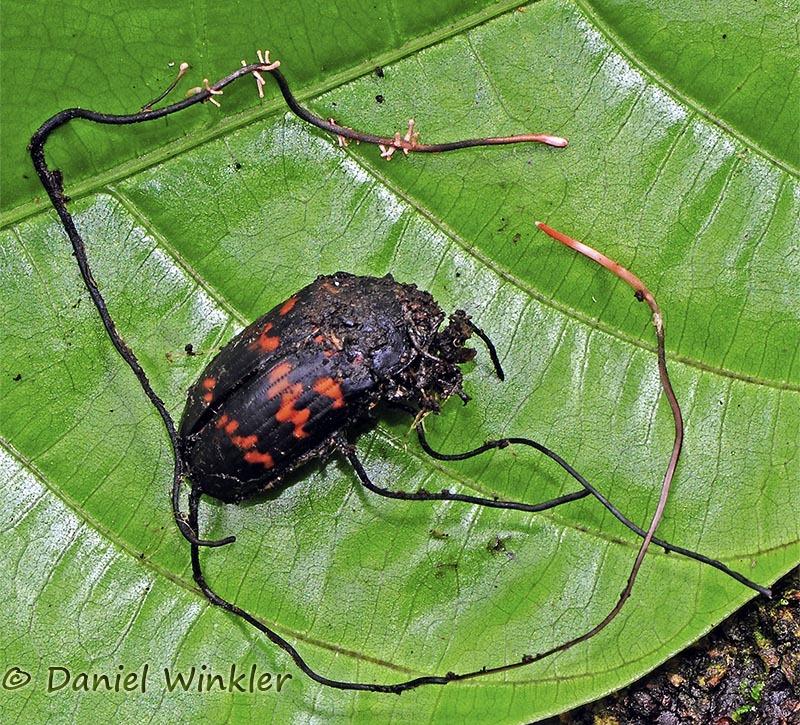 It will be interesting to find out if DNA analysis shows any difference between Cordyceps militaris growing on pupae or larvae. In general C. militaris is globally distributed, but there are speculations that it is a species-complex rather than an identical species distributed on all continents but Antarctica. 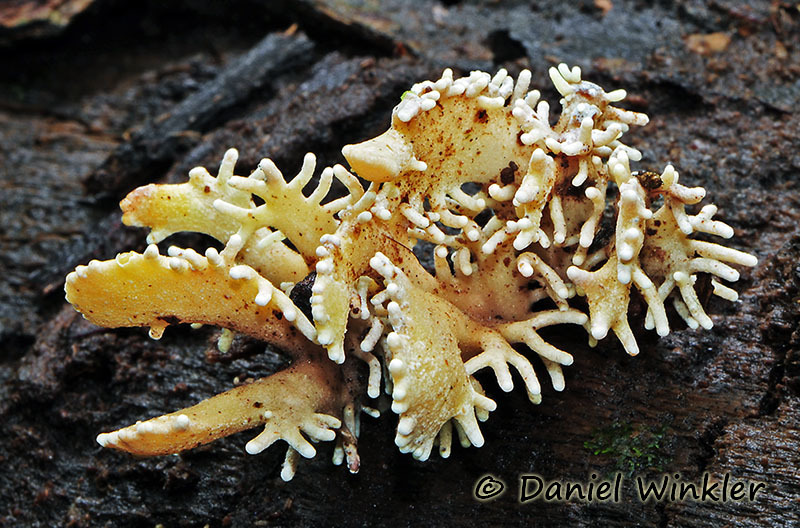 A seven-branched Cordyceps militaris growing out of a Lepidopteran larva photographed right after excavation. 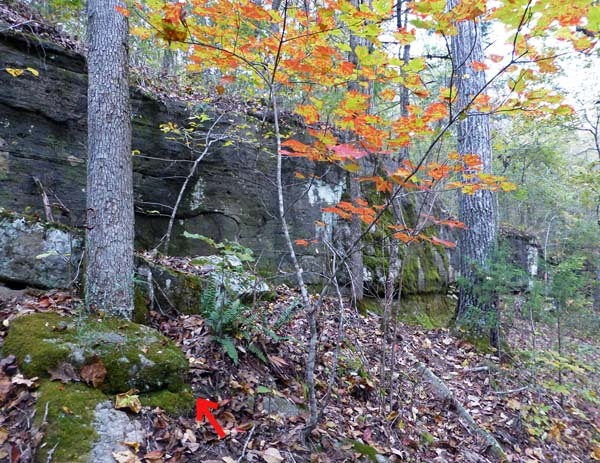 It was found by Rachel Giffin and Ken Gribble. The same Cordyceps militaris specimen well cleaned. Unfortunately, one of the stromata broke off while showing it at the NAMA meeting. Mature fruiting body covered by round knobs, which are the ostioles (openings) of the perithecia, the "organs" in which the spores are produced in asci. A double header - Most specimen had only one stroma. Out of a dozen only two had two heads, and one with seven "heads". 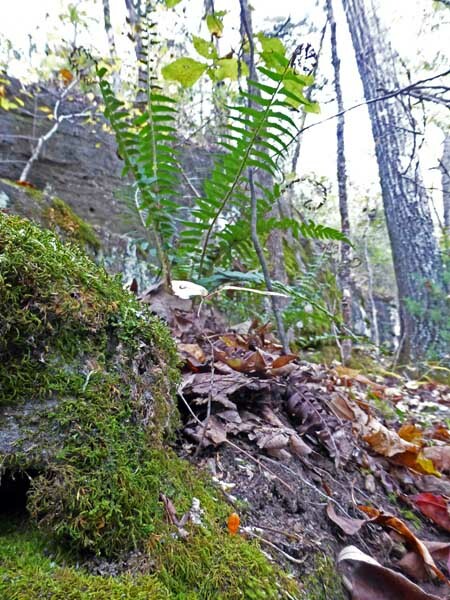 The site of some of the Cordyceps militaris specimens in a typical Arkansas oak-hardwood forest. The arrow shows the location of one Cordyceps militaris. The photo on the left shows the same stroma. Cross section showing the half-embedded perithecia lined up along the outside. In the upper left side of the exposed stroma one can see perithecia that broke away while slicing the stroma. 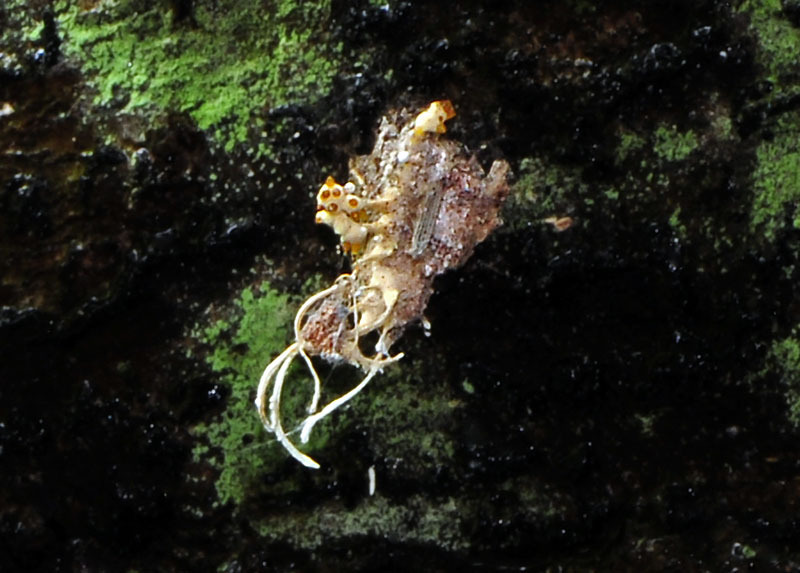 A single fruiting body of the this insect parasite growing on the larva. It seems that the stroma is attached to the rear end of the larva. Interestingly the stromata of these specimens are growing out of the exoskeleton in several places, but "neck" and rear end seem most common in the few specimens we dug up. 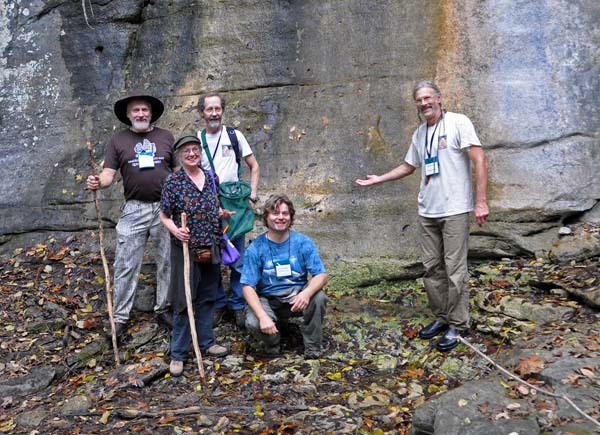 The Cordyceps digging crew: Katie, who found the first specimen and husband Drew Parker and myself Daniel Winkler framed by the Evans brothers Don (on the left) and Larry showing off Jake's Fall pathetic water run. Not pictured Rachel Giffin and Ken Gribble who showed up a moment later.